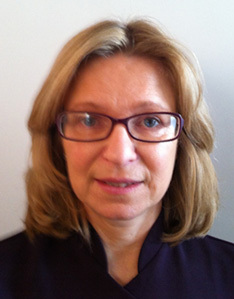 In 2004, having spent the previous 18 years bringing up 3 children, Jayne undertook a course in Holistic Therapies at Newcastle College and qualified in Aromatherapy, Reflexology, Massage and Indian Head Massage. She was awarded the Student of the Year prize by the college for her work that year. Following graduation, Jayne worked in private practice but following death of her mother from cancer, became drawn towards hospice work. She started initially as a volunteer at St Oswald’s Hospice and then became an employee in 2010. Always keen to increase her knowledge, Jayne has continued to study and has undertaken courses in Clinical Aromatherapy in Palliative Care, and LaStone Therapy. She qualified in Sports Massage, Reiki and she is a Baby Massage/Baby Yoga Instructor. Her early work with patients at St Oswald’s primarily involved the use of aromatherapy, reflexology and reiki treatments, but when Jayne experienced the ‘M’ Technique® first hand at the course in April 2010, she immediately realised the great benefit this could bring to the terminally ill. Jayne qualified as an ‘M’ Technique® Instructor in November 2011. Jayne is based in Northumberland but is willing to travel throughout the North of England and is particularly interested in helping others who work in hospice care.